Central Americans in a caravan of asylum seekers that traveled through Mexico to the border with San Diego and their supporters are rallying on both sides of the U.S.-Mexico border wall. SAN DIEGO (AP) — A group of Central Americans who journeyed in a caravan to the U.S. border resolved to turn themselves in and ask for asylum Sunday in a direct challenge to the Trump administration — only to have U.S. immigration officials announce that the San Diego crossing was already at capacity. Nearly 200 migrants, many traveling with children, had decided to apply for protection at the nation's busiest border crossing after many fled violence in their home countries, organizers said. The caravan got attention after President Donald Trump and members of his Cabinet called it a threat to the United States. Shortly before the migrants were expected to arrive, U.S. Customs and Border Protection said San Diego's San Ysidro crossing would not immediately be able to handle more asylum seekers. It can hold about 300 people at a time, and officials had been warning that it might fill up. "At this time, we have reached capacity at the San Ysidro port of entry for CBP officers to be able to bring additional persons traveling without appropriate entry documentation into the port of entry for processing," Commissioner Kevin McAleenan said in a statement. "Those individuals may need to wait in Mexico as CBP officers work to process those already within our facilities." He said the crossing could take in additional people as space and resources become available. Despite the news, about 200 migrants still started walking toward the port. Rodulfo Figueroa, the top Mexican immigration official in Baja California state, told caravan organizers to send in an initial group of 20 migrants to see if U.S. border inspectors would entertain their request for asylum. Figueroa said he doesn't know if they would be allowed in and had not received word from U.S. immigration officials. "They have been well aware that a caravan is going to arrive at the border," she said at a news conference. "The failure to prepare and failure to get sufficient agents and resources is not the fault of the most vulnerable among us. We can build a base in Iraq in under a week. We can't process 200 refugees. I don't believe it." The migrants had made their way north by foot, freight train and bus over the past month, many of them saying they feared for their lives in their home countries. The Trump administration has been tracking the caravan since it started in Mexico on March 25 near the Guatemala border. Attorney General Jeff Sessions has called the caravan "a deliberate attempt to undermine our laws and overwhelm our system." Administration officials have railed against what they call America's "catch and release" policies that allow people requesting asylum to be released from custody into the U.S. while their claims make their way through the courts, a process that can last a year. Wendi Yaneri Garcia said she is confident she will be released while her asylum case is pending because she is traveling alone with her 2-year-old son, who has been sick. The travelers face an uncertain future if they ask for asylum. U.S. immigration lawyers warned them that they face possible separation from their children and detention for many months. Homeland Security Secretary Kirstjen Nielsen said asylum claims will be resolved "efficiently and expeditiously." But she warned that any asylum seekers making false claims could be prosecuted, as could anyone who assists the migrants in doing so. Asylum seekers are typically held for up to three days at the border and then turned over to U.S. Immigration and Customs Enforcement. 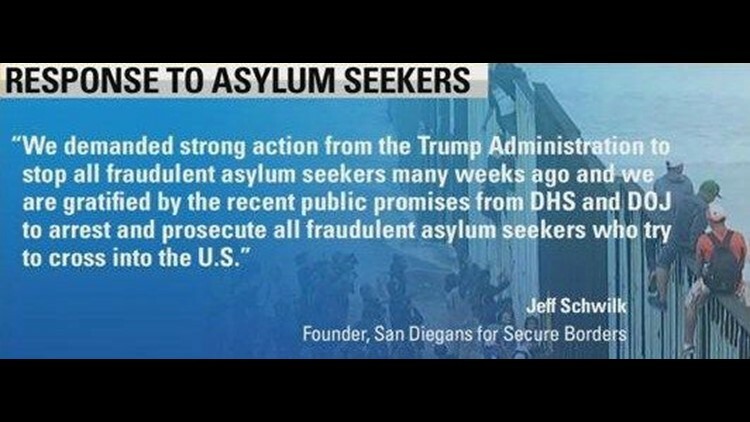 If they pass an asylum officer's initial screening, they may be detained or released into the U.S. with ankle monitors. Maria de Los Angeles, 17, said she felt confident after speaking with an attorney that U.S. authorities would release her while her case moves through the courts because she was traveling alone with her 1-year-old son. She hoped to move in with a sister in San Francisco.